If you are into Radio Control Models or robotics chances are that you have an old RC transmitter laying around. This article describes how to create a motion control module for your RC transmitter, that will allow you to control your model or robot by simply tilting the transmitter case. That's right not sticks! The RC transmitter uses a potentiometer for each axis, it acts as a voltage divider sending a voltage of 0..5V (the middle position corresponds to 2.5V) to the analog input that is converted into a pule of 1..2ms that is sent over RF. This module converts (amplifies and shifts) the accelerometer analog output , usually 1.65 +/- 0.4V to the same range of the potentiometer and sends it to the transmitter instead. Note that according to the rules of a feedback op-amp the voltage on it's inverting/non-inverting terminals tends to equalize so V(+) = V(-) and in our case = Vref. According to our schematic G = R2 / R1 = – 5.12 , this will convert the accelerometer swing of 0.4 V to a swing of 0.4 V * 5.12 ~ 2V . Well, this is the theoretical value , in practice we adjust the trimmer R3 until the output is 2.5 while the accelerometer is in laying in horizontal position (has an output of 1.65V). To build use a small proto-board following schematic. Part numbers are mentioned on schematic. Hook-up with the transmitter is described in images below and on the schematic. For accelerometer use Acc_Gyro or similar module, or build your own accelerometer break-out board. The module is mounted in a free space under antenna using double-sided foam tape – best way to mount an accelerometer to avoid vibration. Note that we get +5V power for the module from the potentiometer contacts. You can test with a led that the power contacts can deliver at least 20mV, the module uses far less <5mA. Here is a close-up of the module, as you can see I did my own accelerometer break-out board, but you can buy a pre-assembled one , there are many choices. You will need an analog accelerometer for this project. Enjoy your new RC Tilt Transmitter. For any comments/questions use the comment form below. we can support each other..
Hi, I have a question about your motion tilt control. I’m relatively new at diy electronics/schematics, but does having two axis here require two TLC2272ACP circuits? 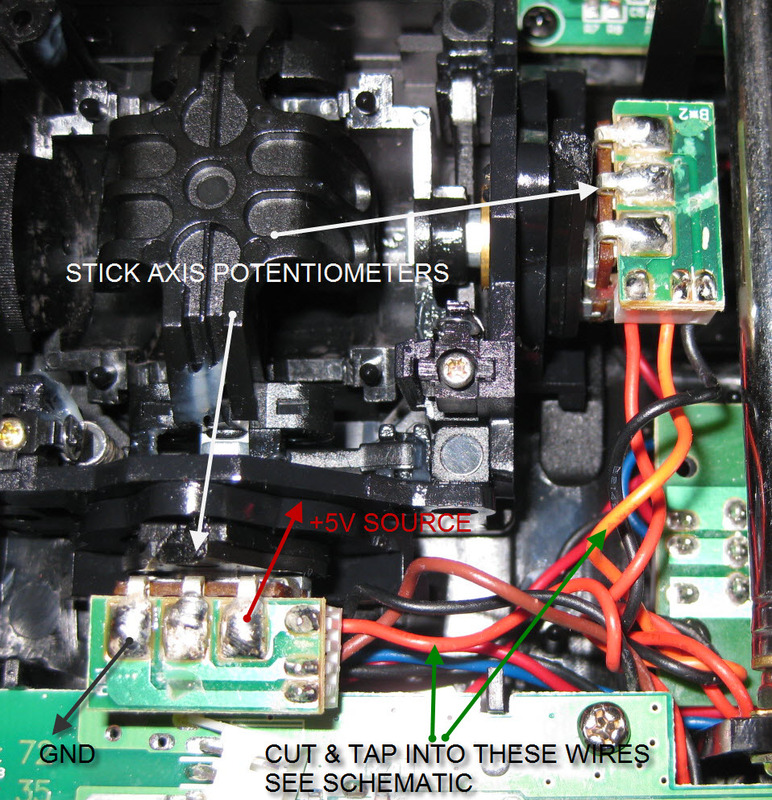 Also, in your close-up image of your circuit, are you handling voltage regulation yourself since it’s a homemade accel. breakout? Evan , yes I have a 3.3V voltage regulator that regulates the existing 5V power from transmitter. This regulator is the TO-92 part you see on close-up. I can also suggest acc_gyro board since it already has voltage regulation. One problem I had with this particular design is that when the antenna is fully extended the circuit picks up a lot of noise (72Mhz), that was somewhat reduced by connecting voltage regulator directly to the battery (12V) and winding the power wires on a ferrite coil. Thanks for the help starlino, would you happen to have source file for the schematic? Aang, that’s nice! If you ever document or blog about your project , please let us know it would be something interesting to look at. Starlino, great success! I have my tx working in both axis from the accelerometer, the only thing is I want to have one axis follow the side to side rotation of my head (fpv style) instead of tilting F to B and L to R. Any suggestions? We could take this to RC Groups if you’d like. Perfect, but could i use this just to steer a single servo, which would be on the z-axis? And possibly use the x-axis for servo jack (to rise my 24 scale 1965 Pontiac GTO Hurst edition). I will need a switch to enable/disable the jack and a separate switch enable/disable the steering tilt control (z-axis). Is this the board you suggested? or would that be to much? I don’t think it will fit in my 8303 Jaguar. Also, my 8303 Jaguar controller runs on 8 AA batteries. Could you please explain how i would have to convert the voltage. Jay, you can use a 1M trim pot instead of R1/R2 – the ratio between R2/R1 will give the gain of the amplifier as mentioned on schematic. http://astore.amazon.com/librarian06-20/detail/0071452818 Best $20 you’ll ever spend. Starlino————–is there a device for 'trigger style' rc controllers? Does this setup is available for purchase? If yes, please let me know the price. We would like to customise the titling angle programatically.